September Jewel of the Month 2010 is a famous ancient treasure that was the inspiration for the Hollywood production film - Alexander. Famous actress, Angelina Jolie portrayed Queen Olympias in Oliver Stone's 2004 biopic "Alexander" opposite Colin Farrell as Alexander the Great and Val Kilmer as Philip II. Olympias claimed that her son Alexander was actually the son of Zeus. 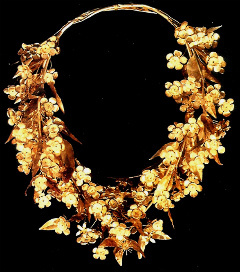 Angelina wore jewelry for the part, in keeping with the period, which was similar in design to the ancient style of jewelry found among the famous treasure of Vergina. Archaeologists were interested in the hills around Vergina as early as the 1850s. Excavations began in 1861 under the French archaeologist Leon Heuzey, sponsored by the Emperor Napoleon III. However, the excavations had to be abandoned because of the risk of malaria. In 1937, the University of Thessaloniki resumed the excavations. More ruins of the ancient palace were found, but the excavations were abandoned on the outbreak of war with Italy in 1940. A list of 100 Best things to do in Italy in the 21st century - Jen's reviewed them Here. However, it was not until 1977, that Professor Manolis Andronikas of the University of Salonika finally discovered the ancient treasure in an extraordinary tomb, believed to be the burial place of Alexander the Great's father, the great warrior king, Phillip II. The Vergina treasure had been buried for centuries in the village of Vergina (ancient Thessaloniki) in Macedonia northern Greece that dates from c. 350 BC. Among the magnificent gold articles found was a Diadem of delicate flowers on which sits a golden fly, an important Ancient Egyptian motif. A circular regal head-band, two oak-leaf wreaths, a woman's pectoral, a men's breastplate as well as many astonishing silver, bronze and gilded vases and weapons were among the articles found.